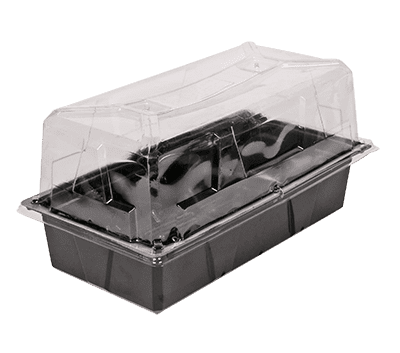 Plastic Thermoformed Trays & Planters | Drader Manufacturing Industries, Ltd.
Draderdomes are made of 100% recycled plastic and can be used over and over again. Grow your own plants with our inexpensive garden starter. The Draderdome is a clear grow dome for germination and seeding of plants and vegetables. Its striking structural design promotes growth and moisture control using a built-in airflow regulator. You can create the right temperature and control of the atmosphere inside your dome to increase your yield. Draderdomes are made of 100% recycled plastic and can be used over and over again. The Draderdome tray is designed to distribute excess water to keep seeds and plants healthy. Matching trays are available. We ship in cartons of 100 and guarantee fast delivery. Draderdome size is 11″ x 21″ x 3″ or 6″ high to fit a standard 10″ x 20″ growing tray.